Jaime is excited to be returning to Somerset where she was born and raised. 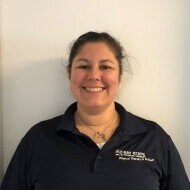 She is a 1995 graduate of Somerset High School and a 2000 graduate of American International College in Springfield, MA with a Masters in Physical Therapy. She is a member of the APTA and sections on Geriatrics and Orthopedics and a member the International Association of Dance Medicine & Science specializing in adolescent Dance Medicine. Jaime is also a Certified Pilates Trainer in both mat and equipment, LSVT BIG Certified, performs Craniosacral Therapy, Manual Lymphatic Drainage Massage, Hand Therapy, and is a U.S. Figure Skating Preferred Provider. In Miami, FL Jaime worked in sports medicine for the adult and pediatric population. While in Los Angeles she provided in-home, Acute care, outpatient, and Performance/ Pilates-based therapy for Universal Studio’s Red Dragon, The Pantages Theatre’s The Lion King and Mama Mia, and for various Cirque Du Soleil performers, as well as owning a business in Pediatric Physical Therapy. In 2001 she was published in Motorcyclist Magazine for her article Five Injuries You May Be RidingToward outlining common injuries motorcyclists might come across after a long ride and how to prevent them. In 2006 Jaime moved to Alaska where she managed a busy outpatient clinic and worked with Fairbanks North Star Ballet performers. She moved back to MA in 2013 to be with family after the birth of her son. “I am so happy and proud to be able to give back to the town that gave me so much growing up”.